#23 is my post, haha. OP talks about Union 76 and I posted the link (now up to 17 stations) but now we have mention of Shell and other places which is what I was referring too. Now a number of '30 stations' was posted; links/locations/name of chain for those? After googling, all I could find for Shell was that they are buying a plant. And Neste shows 'distributers in your area' but these don't show as being stations we can visit but appear to be services for fleets (for like local municipalities) that would deliver a truck to your private pumps. Have you looked into seeing if Propel Diesel HPR is in your area? I know they have a few locations in SoCal. I also saw that Exxon/Mobil stations sell a Synergy Diesel Efficient that has extra additives. The stations near me have been rebranded and show that they have Synergy Gas but not their new diesel yet. I've been filling up with Propel whenever I'm near one but I live in So. Orange County and the only one in the county is in N. OC, by Cal State Fullerton. I hit the one by Ontario airport on my way to Vegas last week and the one in Norwalk when I drop my foster dog at the rescue lady's house in Downey (like when I had to go to Vegas, on the way back). I'm hoping someone will open a pump up in central or south OC soon. If not Propel, than perhaps Union 76, but SOMEONE! I posted that there are 30 stations near me. I went to the 76 website listed in post #23, and based on my location, zip code 95762 which is only about 10 miles from the 76 station where the OP got fuel, the website said there are 30 "76" stations near me with renewable diesel. I stopped by one of those stations today and while they did have diesel, there was no mention of it being renewable and I didn't have time to go in and ask. Didn't notice they had a station locator under the renewable page. Musta been the station locator for all their stations, on their main page, filtered by those near you having diesel but not able to filter it down more to just renewable diesel. You would need to click on a specific town listed on the Renewable page. Then it will show you an address for that particular station. If it is renewable diesel, for sure they will have a sign like the OP showed in his pic as they def. want to advertise the new fuel. 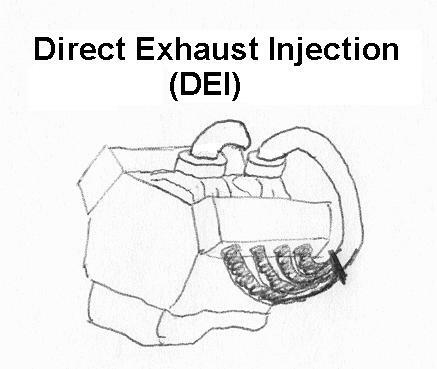 Real "renewable" diesel would be something caught out the exhaust, re-processed and run through again and again. It could be a real perpetual motion fuel. Getting used to anything else would just have to "grow on you". First-Renewable Diesel is refined/processed from feedstock of waste vegetable fats and oils. It is not the same as biodiesel. 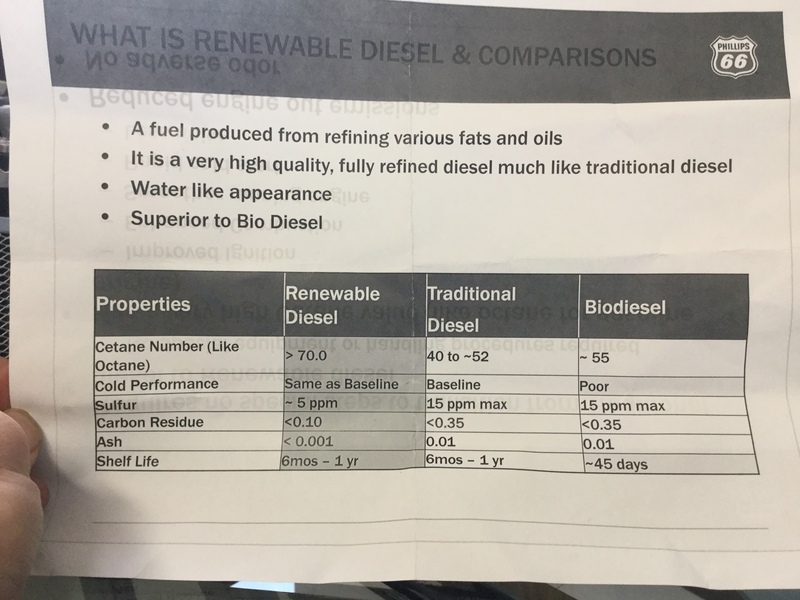 Renewable diesel does not have the drawbacks of biodiesel and seems to meet all the specifications for petroleum based diesel fuel which biodiesel does not. Several companies have proprietary processes to create renewable diesel. Note some processes seem to be able to also accommodate animal fats and others may not. Second-Chevron purchased Union Oil, Texaco, Gulf and Tenneco over the last 30 or so years. The the process of buying and merging these companies into Chevron various parts of the new merged COmpany were either required to be sold by the US government or were sold by Chevron to help finance the purchase or because the particular facility or brand did not fit into the new vision Chevron had for iteself at the time. THird-Somewhere along the way the Union 76 brand found its way to Phillips 66 who now controls it. Fourth-As part of the Texaco purchase Chevron sold the their share of a Texaco/Saudi refining and marketing JV to Shell and that organization became Motiva. In 2017 Shell left the Motiva JV and it became wholly owned by Saudi Refining. Their retail products are marketed at Shell and 76 stations in the Gulfcoast and Southeast US. Motiva licensed the use of 76 brand from Phillips. Motiva licensed 76 stations seem to have the word Motiva to the right of the traditional 76 logo. Sixth-In 2015 Motiva announced it was going to add a renewable diesel processing unit to its Port Arthur refinery. I presume, but do not know for sure, that that plant is now up and running and would likely be the source of the renewable diesel showing up at 76 stations. From what I can see it should be safe to use as petroleum diesel and does not seem to have the limitations that biodiesel has on oil change intervals. It isn't clear to me if it has the added lubricity benefit that biodiesel has. It also isn't clear if the 76 renewable diesel product is 100% renewable diesel or just a blend. Propel seems to be 98% renewable diesel. ANyhow, that is combination of what I know I know and what I think I know about the subject. Interesting, im not sure New Braunfels qualifies as "Gulf Coast", but it is located in south/central Texas which is a gulf coast state. A while ago I passed a brand new Shell station in New Braunfels with a sign for premium diesel. I meant to go back and give it a whirl some time, but just haven't been back that way since. The effect of HVO (renewable diesel) on soot emissions is presented in Figure 5. It is clear that this 2nd generation biofuel causes significant reduction in soot emissions in the whole engine operating range of up to 75%, a finding that comes in agreement with previous research (Murtonen et al., 2009; Sugiyama et al., 2011). The reason is that HVO is an exclusively paraffinic fuel with higher H/C ratio, no aromatics, sulfur and other mineral impurities that are responsible for soot formation (Rimkus et al., 2015). More like, "Kalifornia ditched GDE."